If you’re a professional who’s tasked with finding top talent to fill an open position, there are plenty of materials available to you on how to interview job seekers in a way that’s both thorough and efficient. You can sort through hundreds of pages about the kinds of questions you should ask, the candidate red flags you should take note of, and the cliché interview questions you should avoid at all costs. And yet, there’s not nearly as much information available to you about what the job seeker needs from you, and how you can make the process more pleasant for those in search of new employment opportunities. For hiring managers and recruiters who work directly with potential employees, knowing what these individuals could benefit from hearing during your conversation is invaluable. It allows those doing the hiring to make better choices as they fill open roles, while also enabling them to make the interview process smoother and more transparent for everyone involved. They’ve probably read a general job description before they applied for the position, but an interview is the perfect time to add some specifics to the basics the candidate is already aware of. Give this individual a real sense of what this position looks like should they get hired. What kinds of projects will they be working on? What types of clients can they expect to see on a regular basis? Who will they be working with most closely? To whom do they report? These details provide valuable insight about the day-to-day of the position in a way that a bulleted list of duties simply can’t. Everyone defines job success differently. You want to be very specific about the goals for this position so that the individual knows what’s expected of them. This should include both short- and long-term plans. What should they be achieving a month after they begin? What about six months from now? A year? Being very clear about expectations ensures that the latest addition to the team stays on track. When success is defined in clear, measurable goals, both employee and manager can stay on the same wavelength. Because company culture is becoming increasingly important to those seeking out new employment opportunities, you want to make it a point to paint a clear picture of what the brand stands for. What are your core values? What is the vision for the business’s future? What kinds of people typically succeed within this company? Job seekers want to know they’re going to work for a business that represents something beyond just a profit and loss statement. They also want to be sure the business’s vision aligns with their own personal values in order to verify that this will be a good fit long-term. Ideally, you’ll find an individual who’s looking to join a company for the long haul. This means they’ll want to hear about available growth opportunities. Where is there room for advancement within the organization? Is it possible to start in one department and transfer to others? Are there opportunities for professional development through conferences or training seminars? Provide detailed examples about how this growth plays out. You might even want to share real world case studies about how past employees have developed and advanced within the business. Job seekers want to know they won’t be pigeonholed into one position throughout the duration of their time with an organization. Many individuals are concerned about work-life balance as they seek out a new job, particularly as it becomes common to be asked to work longer hours with less time off. Speaking to this point honestly is important. How does a typical workweek breakdown at the organization? How much weekend or late-night work is required from employees? Does it vary from department to department? Does it change seasonally? How much vacation time do employees enjoy and when can they take advantage of this? Does the business allow flexible work policies, such as telecommuting? Job seekers might be hesitant to come out and directly ask these questions, fearing they’ll look lazy, but this information is important as they decide whether the company’s policies will work for them. You know #jobseekers want to hear about #WorkLifeBalance, so just tell them about it. Talking about responsibilities and goals is a valuable discussion, but you also want to get beyond that during your interview. Touch on what daily life is like within the office. Is it a collaborative place or do employees typically keep to themselves? Do people tend to stick around for post-work happy hours and softball games or is it the kind of place where you come in, do a good job, and then head elsewhere to socialize? There’s no right or wrong answer, but honesty is important. If you’re painting the company as a tight-knit group bursting with camaraderie and three months in your new hire is wondering why people haven’t taken the time to learn their name, don’t be surprised when they don’t end up sticking around. Ultimately, a new hire’s direct supervisor will have a major impact on their overall experience. Communicating thoroughly about what to expect in terms of company management is an essential part of a successful interview. There are so many management styles at play in offices today, you want that individual to go in knowing what to expect. Is their boss the type who prefers to get updated through each step of a project? Does the manager take a hands-off approach, preferring only to field major questions? Understanding how particular managers operate and how they interact with their team is a highly valuable piece of information that you can provide to job seekers. It seems obvious, but this isn’t a topic of discussion to glaze over — particularly since it can be one that prospective employees are hesitant to bring up. They may feel uncomfortable discussing money, and they might also be worried that the hiring manager will think they’re only focused on the paycheck should they broach the subject during an interview. During a long interview that covers many other aspects of a job, it’s important not to forget to cover these basic points, as it’s job seeker information worth providing. You may not have this data on hand, but if it’s possible for you to provide it, job seekers typically like to get a sense of their odds of receiving an offer. Hiring has changed dramatically as technology evolves. Now, with systems like video interviewing in place, expanding your team has become much more streamlined for both job seekers and hiring managers. However, this has also shifted the standards of the practice a bit. Providing clarity about what’s expected from the individual seeking employment can be beneficial. If they’d like to follow up, what’s the best way to do so? Does the hiring manager prefer to be contacted via email or telephone? About how long will they have to wait before they get an answer on whether they’ve received an offer or not? Even if you’re fairly certain that everyone is on the same page, it’s always beneficial to share this with the job seeker. If they’ve been asked to submit samples of their work, for example, reiterate this. If they’ll need to submit paperwork to the HR department to review, remind them of the deadline. Job interviews are stressful and can cause even the most polished professional to get overwhelmed. A gentle reminder keeps everyone on track. #Jobinterview finished? Be sure to tell the job candidate what’s next. Besides providing as much information as you can about the open position, there are plenty of other ways those who are involved in the interview process can reduce stress for those seeking new employment opportunities. You may feel you have to ask tricky questions like “What’s your worst quality?” in order to do a thorough interview, but in reality, quite the opposite is true. You can conduct an excellent, informative interview without trying to get the candidate into a “gotchya!” situation. Ask questions that enable them to provide a detailed response about their experience, where their passions lie, and why they think they would be a good fit for the role, but don’t go out of your way to try to stump them. If a candidate is coming into the office to chat about an open position, introduce them to essential office personnel, but don’t overwhelm them with a never-ending tour filled with names they’ll never remember. You’d hope that a candidate comes into an interview armed with thorough responses and insightful questions, but this should go both ways. If your first time glancing at a candidate’s resume is when they’re sitting across from you to interview, you’re not approaching hiring correctly. Take the time to scope out the individual’s resume in advance, and ask pointed questions that highlight particularly interesting portions from the document. Anticipate the kinds of inquiries they might have, and do your best to gather as much information as possible so that you can provide them with all of the details they need to make an informed decision about whether this job is a good fit. You certainly want to maintain a sense of professionalism during the interview process, but there’s no need to take the human element out of the dialogue. You can be warm and welcoming and still keep the interview on track. Don’t be afraid to show your personality during the discussion. Before an interview, the job seeker will have had contact with someone from the company. If possible, make sure that person is present for the candidate’s first interview. Even if they haven’t met this contact in person yet, having a pre-established relationship with someone in the room can help to ease nerves. This is especially important if you’re doing a panel-style interview, where they’ll be facing a number of strangers at once, which can feel daunting. No need to waste time covering information that is easily gathered from a resume, but at the same time you want to get the person comfortable before you dive into more hard-hitting questions that need to be discussed. A little small talk can make a major difference when it comes to easing a candidate’s nerves. Yes, you’re interviewing them for a job, but you also want to know what this individual is all about. Therefore, chatting about lighter topics isn’t a waste of time, but can actually be highly informative. While you may be totally comfortable in your office, consider how it would feel to step into the space for the first time, particularly in a job interview setting. It would probably seem intimidating. Make it a point to make the office seem as inviting as possible. Give the interviewee a warm greeting and offer them a beverage. Make sure the room where interviews take place looks friendly, rather than stark and sterile. These small details may seem unimportant, but they contribute to a positive overall experience for candidates. A warm welcome goes a long way in creating a great #candidateexperience. While conducting a thorough interview is an essential part of the role for recruiters and hiring managers, these professionals should expand their focus beyond just moving top talent into an open position. Providing valuable information to the candidate and making it a point to create an interview situation that’s as comfortable as possible benefits everyone involved. Doing so takes some of the stress out of the process and enables the job seeker to deliver more authentic, polished answers while demonstrating their true personality. What some other job seeker information you need to remember to give during the job interview? Share in the comments below! 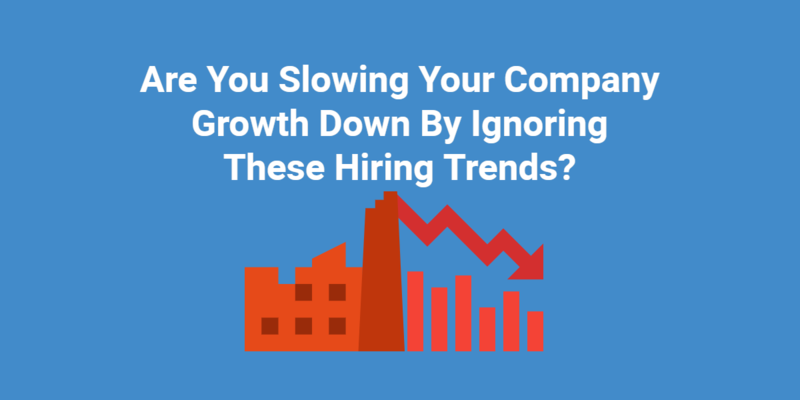 Are You Slowing Your Company Growth Down By Ignoring These Hiring Trends?